1. When my parents’ sour cherry tree died of a horrible tree disease several years ago, I cried and held a private tree funeral service in my head. 3. Last July I spent over an hour on the phone trying to track down fresh sour cherries on the South Island, to no avail. I was cast into a deep depression, lasting at least 24 hours, or possibly longer. So this year, folks, THIS YEAR, is a CHERRY-RED LETTER YEAR!!! Because I found fresh sour cherries in not one, but two, locations in Victoria!!!!! I am excited enough for another abuse of exclamation marks!!!!!!!!!!! 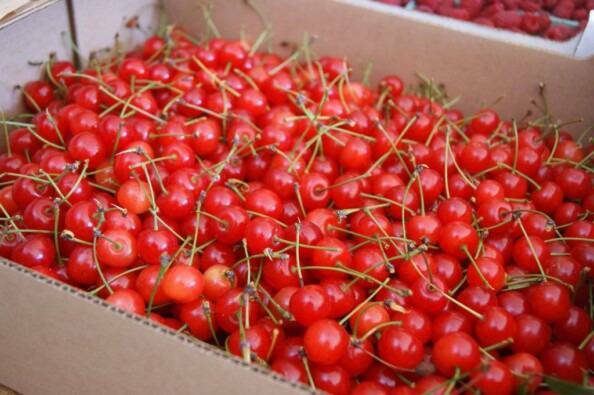 Sour cherries, otherwise known as tart cherries, are what give cherry pies their over-the-top cherry flavour. 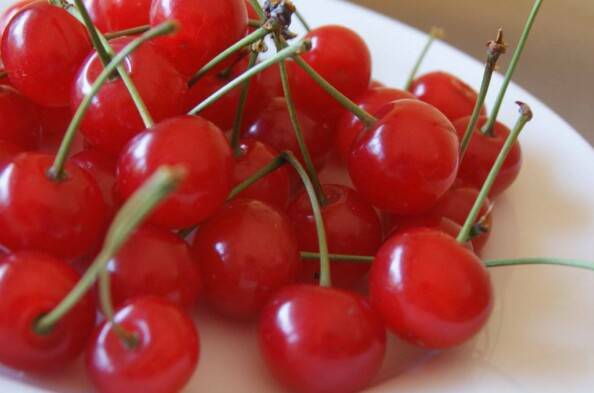 For eating out of hand, give me sweet cherries any day (i.e., Bing, Rainier, Lapins). But for cooking, you need sour cherries. 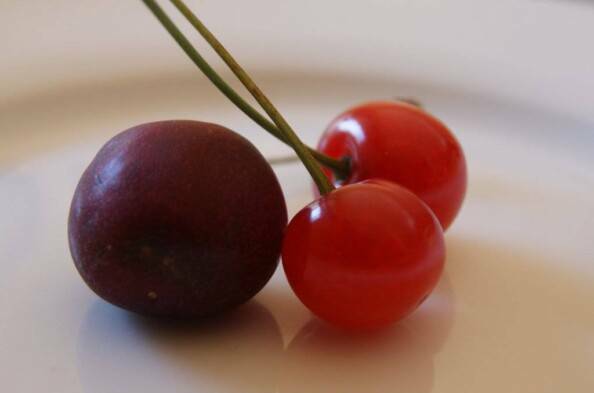 Cherry jam, cherry pie, cherry ice cream, black forest cake – when you need that amazing cherry flavour hit, the one that tastes like a cherry candy, or better yet, tastes like your great-grandma’s cherry pie, you need to find yourself some sour cherries. The first sour-cherry-seller I found in Victoria is the one and only amazing Root Cellar. We all know and love that place by now, but let’s give it another plug, shall we? Where else in Victoria can we find fresh Thai galangal, fresh curry leaves, local broad beans, dirt-cheap vine-ripened tomatoes, and fresh sour cherries all in the same place? Nowhere else. The Root Cellar, For The Win!!! Secondly, Fieldstone Farm on Oldfield Road in Central Saanich. A mere 20 minute drive from the city, you can pick the sour cherries yourself, or have the farmer pick for you. They grow the Montmorency cherries, which are absurdly easy to pit and are so beautifully perfect that they look like glossy candy-red fake cherries. Between the two places I was able to purchase almost 20 lbs of my precious dream fruit. Most has gone in to the freezer and jam jar, but I made sour cherry cobbler a couple of times for family and friends. What can I say? It was a huge hit. Both times. This simple and delicious summer dessert can be made with fresh, frozen, or canned sour cherries. The almond biscuits make a lovely counterpoint to the tart cherries. 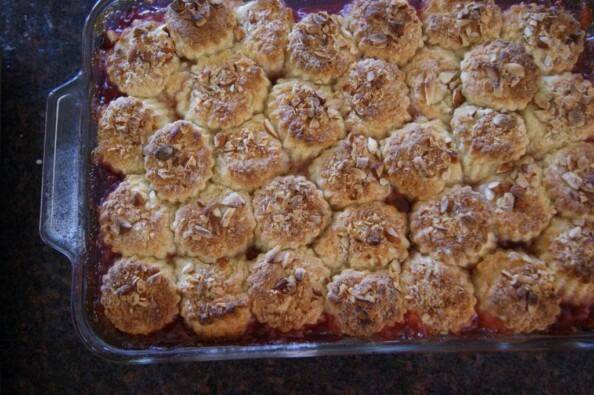 NOTE: the photos here are from a double-sized cobbler I made at a lake-house weekend. I didn’t quite have enough cherries with me to stretch for the double batch so the filling looks dry in the pictures. 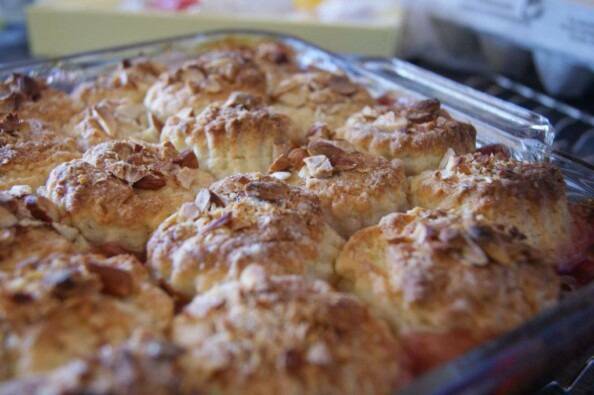 Don’t be shocked if your cobbler looks way more juicy. That is as it should be. 2. In a deep-dish pie pan, combine the pitted cherries, the sugar and the cornstarch. (If using canned cherries, drain first, and add ½ cup of the canning syrup to the mixture). 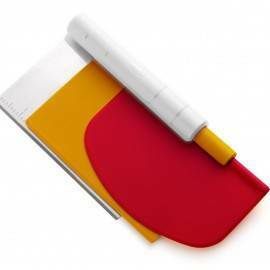 Cover with foil and place on a rimmed baking sheet on the lowest level of the oven. Bake for 10 to 15 minutes, until mixture is bubbly. Remove foil and stir fruit. Replace foil and return to oven for at least 5 minutes more, until mixture is hot and bubbly all over. 3. Meanwhile, make the biscuits: in a medium bowl, whisk together all the dry ingredients, using 3 to 4 tablespoons of the sugar, and reserving the remaining sugar. Using two butter knives or a pastry blender (or your fingers) cut cold butter into the dry ingredients until the mixture is crumbly, with pieces of butter no bigger than a small pea. In a separate small bowl, whisk together the sour cream (or yogurt) with the almond extract until completely blended. Quickly stir in sour cream mixture, until dough mixture holds together. 4. Turn dough out onto floured counter and gently pat into a disk about ½-inch thick. It will be about 7 to 8 inches around. Cut with small round or star-shaped biscuit cutter (1-inch round or so). You should have about 16 biscuits. 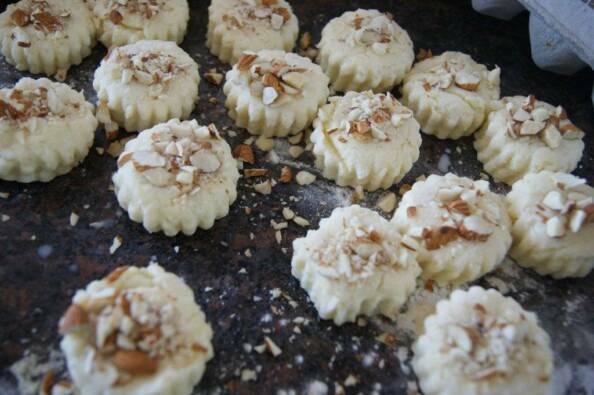 Brush the tops of the biscuits with milk and sprinkle with sliced almonds, pressing gently to make sure they stick. Sprinkle tops of biscuits with remaining sugar. 5. Remove pie pan from the oven. Remove and discard foil. Stir the filling mixture one more time. 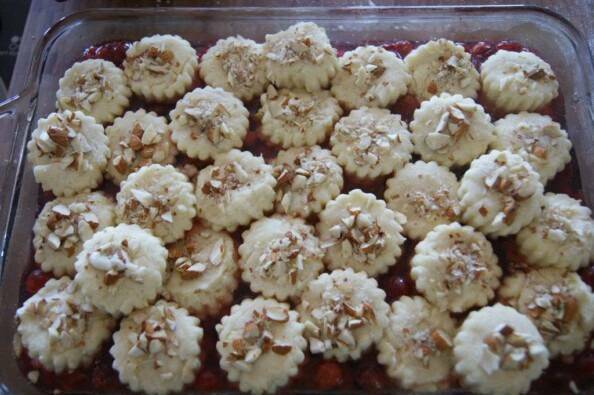 While the filling is still hot, place biscuits, almond side up, on the filling, arranging in a nice pattern. Return pie pan to the tray in the oven and bake for 20 minutes more, until biscuits are golden brown and filling is thickened. 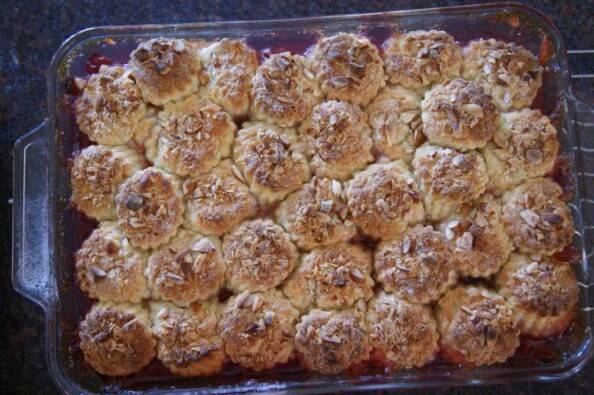 If the biscuits are not quite brown, leave the cobbler in the oven for a few more minutes. Remove to a wire rack to cool. 6. Serve warm or at room temperature with whipped cream or ice cream. Wow, Heidi girl. That looks amazing! I am such a fan, of you of course and of cherries. I have had intentions of getting my cherries from OK Fruit, whom delivers organic and non to the island weekly. Sadly I missed picking up my last order and I think the Bings are done! Big POUT! I like to pit and freeze them. Amazing results for flavour and texture! I cannot wait to try this recipe. Yo have taken a delicious and amazing dish and made it fabulous looking as well. Bravo Chef! Looks simply gorgeous, I have tried to make it many times but the end result usually is not so good I think I am doing something wrong . Thanks for sharing. Hi Dennis – that’s strange. I’ve had many people make the recipe with great results. What is the final result when you make it? Too sweet, too sour, too runny?? I can help troubleshoot, if you would like. Maybe we can fix the problem. hahaha! i laughed out loud at the “abuse of exclamation marks” comment…i too, love to exclamation points…i knew my best friend and i were kindred spirits because she uses them as much as i do! 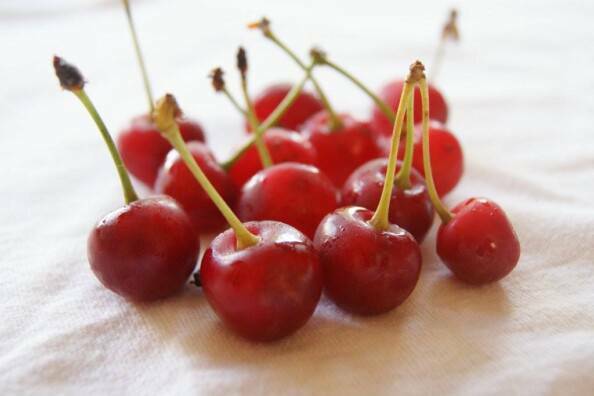 thanks for the post on where to find sour cherries…have always wanted to try cherry recipes but never knew where i could find them in victoria. 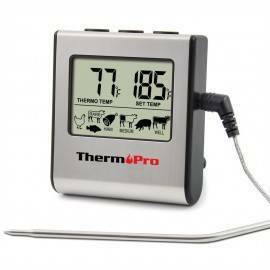 root cellar, here i come! What do you think about using morello cherries in place of the sour cherries? I’m down in southern California now and have not come across true sour cherries like the ones my grandma used to grow (the ones that you use above), but I do have access to morello cherries in jars from Trader Joe’s. Maybe ease off on the sugar? Worth trying? Thanks! Hi Sarah, yes, you can definitely try the morello cherries! Does it come jarred in syrup? Heavy or light? How much you ease up on the sugar will depend on how sweet the juice/syrup is. 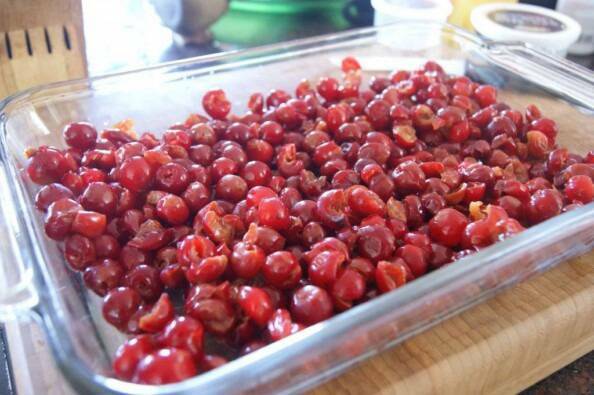 There are instructions in the recipe for using jarred or canned sour cherries. Basically, drain the cherries, reserving the juice or syrup, measure out the cherries and then add to the measure cherries about 1/2 cup to 1 cup of the reserved juice. 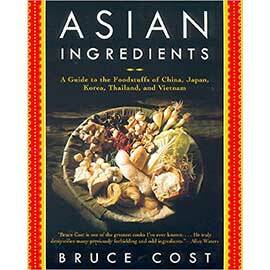 Reduce the sugar amount as you see fit, mix the cornstarch with the sugar, and proceed with the recipe as written. It may take a couple of tries to nail the sugar quantity. There’s no better colour in the entire tree fruit world! And the flavour is so exceptional, so unique. I love that you tracked down some local ones. Thanks for the tip on Fieldstone Farm. I need to know how you pitted 20 lbs…!